“I’m a Barbie girl, in a Barbie world…” This song was running through my head as I was painting my Barbie nail design. I have seen cameo designs and thought it would be so adorable to combine it with the icon silhouette symbol of the Barbie. 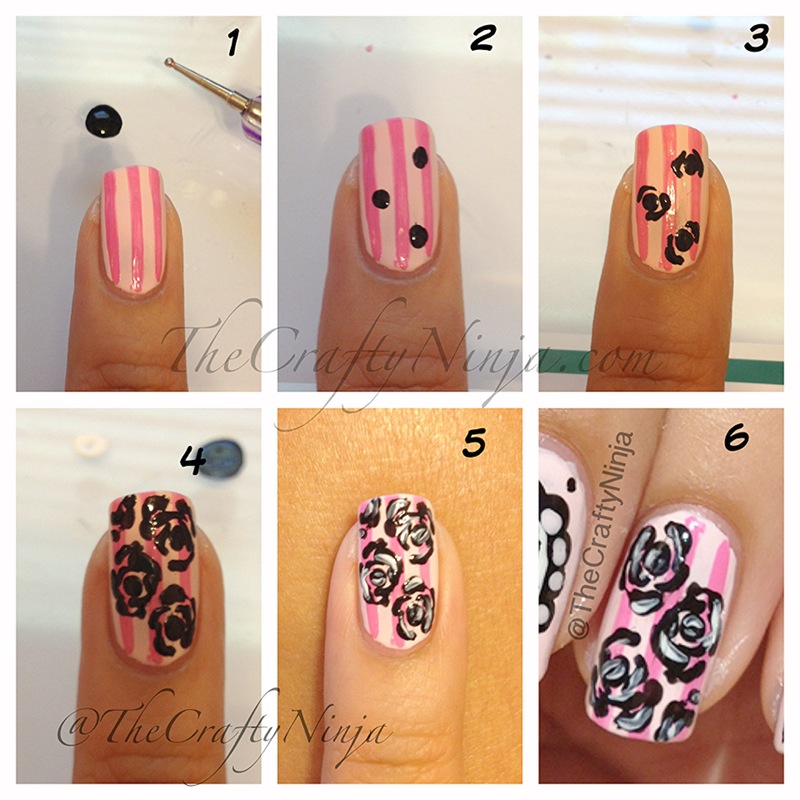 Here is my tutorials on how to create Barbie and the Rose design. I hand painted everything on my nail design, it took me several tries to write Barbie but I love my nails. I can’t stop starring at them, I know this is very egotistically but I’m very impressed with my own nail design. 1.Painted a base color of Essie Fiji. Then an oval with white nail polish. 2. using a nail dotting tool and black nail polish, dot around the the oval. 3. Finished black frame. 4. Using Essie Fiji, use a smaller dotting tool and dot inside the black dots. 5. The finished frame. 6. Retraced the oval and accented some black dots around the frame. 7. Using the thinnest nail dotting tool I made a small oval for the face. 8. With my black striper brush I painted in the hair and body. 9. Added a pink bow and topped it off with top coat. 1. First I created stripes on my nails. 2. With the nail dotting tool and black nail polish I added three dots. 3. Next I added C designs around the dots. 4. I then built the rose petals by adding some wavy lines. You can be messy because they will still turn out. 5. With a white striper I added highlights. 6. They are so adorable when finished!